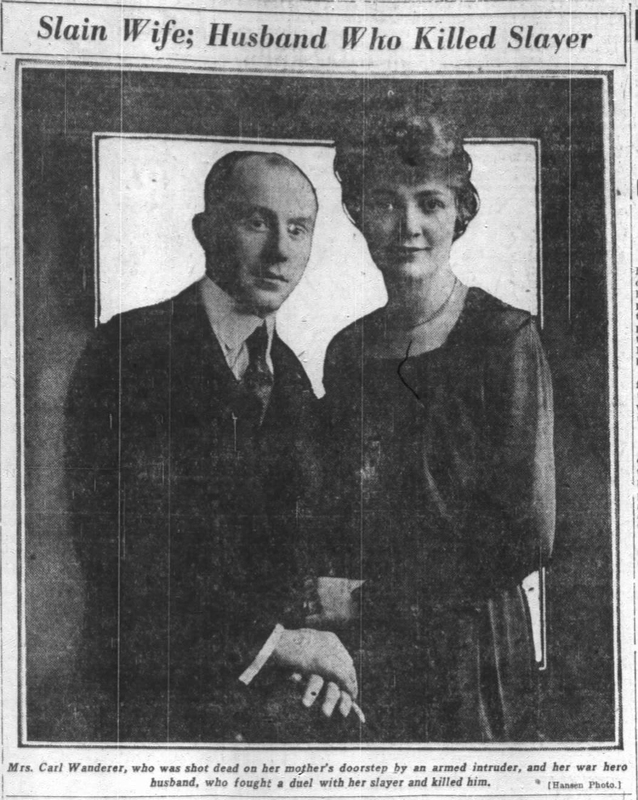 Carl Oscar Wanderer and his twin sister Laura were born in Chicago, June 26, 1895 to Charlie and Anna Wanderer. Carl’s father was born in New Jersey to German immigrant parents while Carl’s mother had immigrated from Sweden as a teenager. Some years after her children were born, a religious mania had taken grip of Carl’s mother, and had grown over time. ‘Voices’ had told her to move to Tennessee, specifically to ‘God’s country’ in Tennessee, and her husband thought country living might be just what she needed. He had to mind the butcher shop though, so he sent her, fresh from her breakdown, to Tennessee by herself but with his proxy to purchase a farm. She found a forty-acre plot suitable for a vegetable farm in the tiny town of Deer Lodge. Carl hated life as the man of the farm. Reading at night would take him away from his troubles and a book that he was engrossed in reminded him of his own situation; a fella with the weight of the world on his shoulders solved all of his problems by up and joining the army. In one of his earliest displays of narcissistic and rash behavior, Carl did the same thing. The next morning Carl rose earlier than normal and walked into town. He caught a train to Harriman, Tennessee and walked into a U.S. Army enlistment office. The seventeen-year-old Carl then forged his mother’s signature in order to sign up for a three-year tour in the army. Upon waking his sisters and mother found no sign of Carl, nor any note, to explain why he had run away. Nor had he left them any instructions or guidance of how the three women should manage his duties on the farm. A letter arrived weeks later to inform them that he had joined the army and was stationed in Ohio. The farm failed soon after he left, leaving his mother and sisters no choice but to leave God’s Country and return to the smoke-filled streets of Chicago. Wanderer served in Troop I of the Sixth Cavalry and spent time in Veracruz, Mexico after the occupation had started as a result of the Tampico Affair. On the night of May 5th, 1915, with her only son hundreds of miles away, Anna Wanderer woke up screaming in the middle of night. Her family rushed to her side, where she told of having the worst nightmare she had ever had. She had dreamt that she had seen Carl, being hanged from a tree, in a lynching. The hysterical woman was put back to bed with assurances that, it was only a bad dream, and Carl was safe on his army base in Texas. The next morning, her family found her dead of an apparent suicide. The 49-year-old women, had sliced her own throat, with a pair of kitchen shears in the middle of the night. 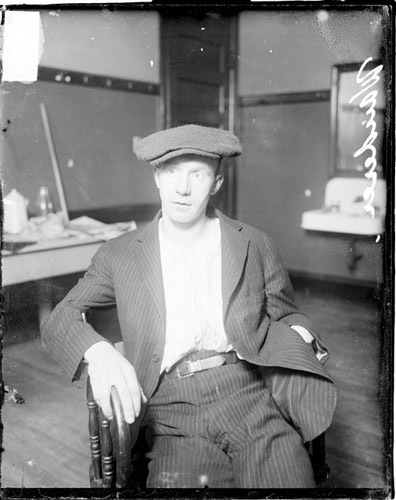 Carl, was given a furlough to return home to Chicago, to attend his mother’s funeral. Sensing Carl’s depression, his cousin Fred Wanderer decided to try to cheer him up with a going away party before Carl was to return to his unit in Texas. While at the party, Carl spied a familiar face, one that he had known for years, but had never really gotten to know. For the first time, in quite some time, a smile crossed Carl’s lips. He walked up, and reintroduced himself to one of his former butcher shop customers, Ruth Johnson. Contrary to some narratives, Wanderer was discharged from the Army in 1915 and was home in Chicago before the Mexican Punitive Expedition was formed to chase down Pancho Villa. Wanderer later reenlisted in the Army in August of 1917 to go fight in World War I. Carl’s didn’t make it to France though until July of 1918, didn’t get to the front until September, and when he did get to the front, he was stationed in the mountain resort town of Gerardmer in the Vosges mountains at the very far southern end of the western front near Switzerland. While hundreds of miles of the Western Front are the familiar fortified trenches, buttressed with lumber, sandbags, stone, and earth, separated by a no man’s land strewn with barbed wire… the front in the Vosges Mountains was often made up of individual fortified defensive bunkers. The rough mountains, and rougher weather, had relegated the Vosges theater to almost a stalemate. The closest Carl would come to a fire fight occurred, when gunfire flared up against Carl’s position one night, but the flare up, turned out to only be covering fire, as the Germans fell back, in retreat. Soon, the Sixth Division Carl was apart of started to earn, what became the division’s nickname, “the Sightseeing Sixth.” Wanderer’s time in WWI would feature far more marching that fighting. Whether it was Wanderer playing up his war service, or a newspaper reporter spicing up his story, in the days after the murder of his wife and the Ragged Stranger, Carl was reported to be a war hero. Newspapers across the country wrote that he was a recipient of the army’s Distinguished Service Cross and the French military’s Croix de Guerre. In truth, he won neither. While Wanderer’s military career advanced from private to 2nd Lieutenant, he was never awarded any medals for valor or distinguished service. His hopes of killing Germans dashed, Carl returned to the work he hated in the butcher shop. It wasn’t long though, before a new German, would cause his fortunes to change. A pretty blond customer entered the shop. She had the slightest hint of a German accent and introduced herself to the new butcher. Julia was her name she told Carl. Julia Schmitt. While Carl flirted with her whenever she came into the shop, flirtations would be all that were exchanged as unbeknownst to Julia; Carl had a fiancée at home, and a wedding to Ruth Johnson prepare for. Wednesday, October 1st, 1919, Carl and Ruth had a quiet ceremony at Messiah Lutheran at 3309 N. Seminary. Afterwards, the newlyweds returned to the Johnson family apartment to celebrate with their families and a few friends. Married life fit Ruth perfectly and it wasn’t long, right before Christmas, Carl came home one night and Ruth pulled him close and smiled ear to ear, a smile that could only mean one thing; there would be another stocking to hang the next Christmas. Carl hated being a butcher, he didn’t want a baby, and he found his world stifling to him, and closing in more and more, every day. More and more whisky was drank to stave it away. Thoughts of his youth and running away from the family farm returned to him but how could he run off with a wife to care for and a new baby due soon? As June 1920 got underway, Carl was not focused on his upcoming child as most expectant fathers might be. His attention had turned from his soon to be growing family, to the soon to be 17-year-old Julia Schmitt. Their flirtations had resumed and out of earshot of his father Carl asked if she would accompany him to Riverview Park. She said yes. After closing the shop on a Tuesday a couple weeks into straw hat season, Carl cleaned up, put on his new hat, and met Julia at the corner of Western and Logan. The couple caught a taxi, a rare treat for the young girl, and headed north up Western toward the amusement park. It wasn’t long before Carl was falling for the young girl. They went out several more times, Carl wrote her endearing letters, and before long he kissed her. Never was spoken of the fact that he had a wife that was seven months pregnant. Like he had many times before in his life, Carl had hatched a plan, put it in motion with little thought and then awoke early to carry it out. “I’m going to kill my wife today”.